Quite a pleasantly surprising reaction to the recent re-appraisal of Neil Young's Are You Passionate? on the album's 10 year release anniversary. Neat thread, as I've come to regard this as an album with its own special place. The title track is actually one of my favorite NY songs of the 2000s. Although it's very personal, but I think it's also as much about 9-11 as Let's Roll ("a world that never stops/turning on you/turning on me", and most obviously the countermelody verse beginning with "Once I was a soldier..."). AYP?, for me, is one of those tracks that plays almost like a poem set to music. I like Goin' Home, too, but the title is definitely my favorite track here. The last couple tracks also appeal. Even though She's a Healer is a long one based on a repetitive riff, I love the overall sound of it--NY grunge crossed with Booker T's highly jazz-influenced Motown sound. If nothing else, this one of the more musically experimental, fusion-oriented albums, and Healer seems to define its sound the most strongly. Maybe it's because I tend to enjoy exploring many different musical styles (I.e. Not a fan of just electric Crazy Horse or only acoustic folksy) that this album is interesting to me. Mr. Disappointment and Differently also stand out in this regard, as does Quit to a degree (I can understand the lyrics being seen as somewhat hackneyed, but the collage of guitar and keyboard is very evocative on its own at times). Like others, I sometimes skip Let's Roll, not so much because I think it is terribly jingoistic (though I can certainly understand how it might come off that way), but because the subject matter is unpleasant, which is compounded by the very heavy-handed approach, and it has some outstanding lines, but really isn't that great a song in my opinion. On a related note, thinking about this makes me wish Neil would release Toast, which I seem to remember hearing was being prepared back in 2009, about the time Fork in the Road was coming out. Given that it was the project directly preceded AYP?, and that Goin' Home was recorded during those abandoned sessions, it seems like it might make an interesting companion piece, provided that it ever finds its way out of the vault. 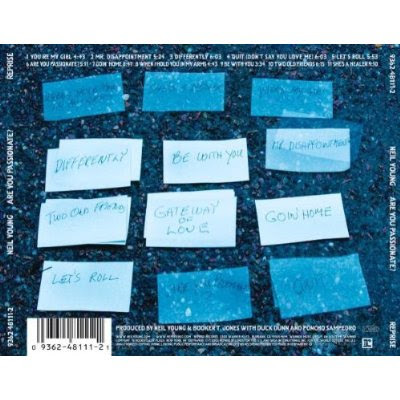 Not to clog up the board, but another thing I wanted to mention having a massive post: the alternate track listing provided by following those notecards shown on the back cover, minus the unreleased Gateway to Love (which I hope is on Toast, crossing fingers again). I actually use iTunes to place the tracks in this order, with interesting, certainly not-bad results. I'm assuming anyone interested in doing this themselves owns the CD (or images can probably be found online), so I won't type out the entire sequence unless anybody asks, but for reference, note that I followed the cards horizontally rather than vertically (i.e. Left to right by rows, rather than by columns). I find this order makes the album darker and heavier, and potentially less commercial. It's bookended by When I Hold You in my Arms and Quit (Don't Say You Love Me) respectively, which drew out some lyrical and musically connections between the two that I hadn't thought about much before and makes the album seem more tightly structured and much more conceptual. But the most radical change is to move Healer from being the album's finale to track 2. But I was surprised how much this started to click after one or two playbacks. I'll let others try it on their own, but suffice it to say that Healer is given two very different lyrical/musical contexts depending on which order one chooses, and in my opinion the most impressive and interesting part is that both musical roles make complete sense. Like I said, though, it's also a tonally darker, possibly edgier album this way. Let's Roll and the title track are still placed back to back exactly as on the original, but are sequenced immediately before Quit, meaning the whole album is now a build-up to its darkest tracks, especially the title track, which also effectively becomes the climax. Whether or not this is desirable really depends on personal preference, and to be honest, I could probably argue either side of that depending on which way the wind is blowing. So I'll leave everyone else to make their own assessments as they wish to. I just encourage other Neil fans to try it, especially if the album doesn't appeal much in the official sequence. I have a hunch the notecard picture may show this as a sequence that was considered for release before Gateway was dropped, especially because I remember a description of them shuffling notecards to determine the sequence for Harvest Moon somewhere in Neil's authorized biography. Also, thanks to Matthew Wilkening over at Ultimate Classic Rock for the reappraisal article "Neil Young’s ‘Are You Passionate?’ Turns 10 Years Old". More reaction to the recent re-appraisal of Neil Young's Are You Passionate? on the album's 10 year release anniversary. I admire your tenacity - for me the running order is not the problem, it's the song quality. Totally personal but it's a record I haven't played for ages until this thread started and I was right all those years ago. Goin' Home is the only one that does it for me (and I like the live versions better than the album version, which mixes down Pancho's guitar too much and the leads are, well, sloppy). Goin' Home is a very underappreciated song because it is an outlier on a not-so-hot album. I love the way Ralph drives the song with the floor tom in the intro and Neil's riff is very reminicient (in a purposeful way) of cliche' 50's cowboy-and-indian soundtrack. It also has great imagery ("her clothes were turning, into sky and stars"). This is one of only a handful of songs from this era that can stand with anything Neil has ever done. Interesting assessment with regard to the order of the songs. Which reminds me of how I have the same fascination with the track listing on Silver and Gold. If I play the album in reverse order, it has an entirely different, and I believe stronger, feel to it. Sometimes I think Neil purposefully arranges the tracks in a weaker order, and part of me thinks that he does it to promote some of the less exciting tracks, challenging the listener to get through a whole album to hear the stronger tracks, rewarding us for listening to the whole album as a single piece. Silver and Gold gets stronger and stronger as it goes. In my opinion the weaker songs are stacked toward the front, while the strongest tracks are mostly saved for the end of the experience. It would be fascinating to have a more in-depth discussion on this phenomenon as it applies to Neil, as a lot of his albums are structured strangely like this. Yes it would make for an interesting thread to discuss song order sometime. We'll put in the hopper for someday.